The circumstances that led to my decision to walk in joy are presented in an earlier post which you can click the title below to read. I’ve also addressed the flip side of this in two previous posts. You can find motivation for living joyfully in the first and specific ways of beating the blues in the second. In today’s post, I simply want to share three benefits I’ve derived from living joyfully.
? 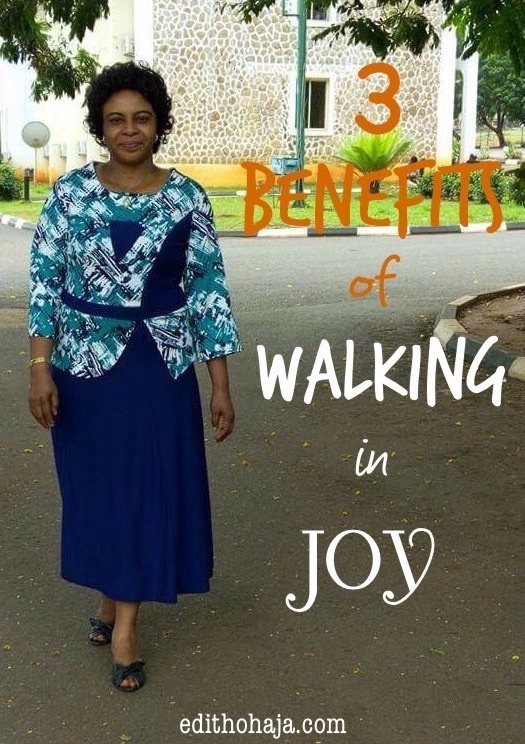 3 Benefits I’ve Gained from Walking in Joy ? Positive emotions have been linked with better health, longer life, and greater well-being in numerous scientific studies. On the other hand, chronic anger, worry, and hostility increase the risk of developing heart disease, as people react to these feelings with raised blood pressure and stiffening of blood vessels.
? I am more approachable: When I was younger, I frowned easily or rather habitually. I didn’t realise this until one of my cousins pointed it out. He celebrated when I smiled and I thought he was being unnecessarily fussy. Until I started work. My first few years on the job, students were afraid of me. I came across as a hard-hearted person and was widely described as such just because of my countenance. (It took a while for me to make connection, though.) Those who dared to come close to me were pleasantly surprised to find me warm and playful. Meanwhile, I was missing many opportunities to be a blessing to the young people I taught because only a few could pluck up the courage to ask for my help. Perhaps, I should tell you a little about my job. I teach Mass Communication in a university. At every point in time, we have hundreds of students, some of them overwhelmed by academic, social, spiritual and financial needs. It’s a great ministry platform only if you make yourself available. In my case, I was physically present but my frown said I wasn’t emotionally available. Praise God, all that has changed ever since I traded my frown for a smile. The thing about being approachable is that not only am I able to reach out to others, people feel freer to bless me too. For instance, I cannot recount the good will, prayers, kind words and so many other blessings I’ve received from my present and former students. I told the hilarious story of one such blessing in the posts below. “When he prepared the heavens, I was there: when he set a compass upon the face of the depth: When he established the clouds above: when he strengthened the fountains of the deep: When he gave to the sea his decree, that the waters should not pass his commandment: when he appointed the foundations of the earth: Then I was by him as one brought up with him: and I was daily his delight, rejoicing always before him” – Proverbs 8:27-30. Our God is the Creator of all things. He made the world in six days but He’s not done creating beautiful things. When I’m joyful, I bring down His presence and the same creative energy flows through me, making preparing my blog posts grace-filled. I believe it can be so for anyone who needs inspiration for whatever wholesome thing they want to come up with. Another exciting thing about this is the infiniteness of this capacity. It’s simply mind-blowing! Would you join me today? Make joy your watchword. But to make this work, you need to accept the finished work of Christ on the cross. You see, sin separated us from God. Christ came and died to pay the debt for our sins. Receive the free gift of salvation he offers today by making Him your Lord and personal Saviour. That would reconcile you to God and give you unhindered access to His presence. God bless you richly as you do this in Jesus’ name. Amen. What other benefits of joy have you observed in your own life and in the lives of others? Very inspiring! Joy is always a choice? It is and a vety good one at that. Thanks for visiting, Crystal, and have a beautiful week in Jesus' name. I love that you make it clear that joy is a choice. In God we have access to joy even in our sad times. And for me joy and creativity go hand in hand as well! So nice to hear that you think so too! No matter what we go through, God can help us to remain positive through it all and come out stronger. I've seen bereaved brethren who were cheerful and comforted those who came to condole with them. The joy of the Lord is indeed our strength. Thanks for stopping by, Alice! You are soooo blessed! We've had the discussion in a bible study that God commands us to be joyous in him because it is a choice! It certainly does improve one's health and creativity; and also I think, my closeness to God! Great scripture on target. Thank you Edith! Joy is a very important virtue to have because it saves us from a lot of emotional and psychological sickness, but is in Jesus that we can get total joy and happiness. Well said, my dear! You are highly blessed in Jesus' name. Awesome thoughts, Aunty! More oil! Glory to God and amen to the last bit. Hope you have been fine. May the rest of the year bring note fulfilment to you than the previous part in Jesus' name. We have to be happy all the time because it saves us from emotional sickness. In Jesus we can get total joy. Being joyful and smiling always makes one's life light and free. i like smiling because it reduces the heaviness, burdens of travails of life. I'm happy I learnt about the helpfulness of smiling too. Cheers! Joy should be the most important thing in every bodies life because when you are joyful you can't have any grudge against anybody and if you are joyful, you are happy. Where there is joy there is light, freedom and true happiness and i pray that every christian has the grace to attain this joy. Amen. That's a good one, Cynthia! There, are huge benefits in being happy all the time. Happiness brings good luck, favour and love. Also you can overcome anger. Its good to be smiling all the time, even in hard situations. We have to be happy always. Thank you very much, Aunty Edith, for this wonderful post. I can see joy as that which can free us from trouble and help us to grow higher, both spiritually and physically. The bible says" The joy in me the hope of glory" there was one specific thing I learn about joy from this which is being joyous or happy makes one healthier and makes people come close to you freely without fear, no wonder they said" Laughter is the best medicine"............wonderful work ma, more grace. It's "Christ in you, the hope of glory" - Colossians 1:27. You're highly blessed, my dear! this is great inspiration, now I know where my problems come from and how to solve them. thank you for this piece ma. I strongly believe that joy is a necessity in life. God bless you, ma! Happiness is just like the strength that motivates and keeps us going in life. So we should not allow anything to deprive us of that. Though sometimes in life we encounter difficulties and we think all hope is lost, we should always trust and depend on God for our survival for he will see us through. There is no doubt that happiness and joy make us healthy and keep us going in life. Aunty be happy joor it is your right. after reading this post i was able to outline the differences between Joy and Happiness. joy is a feeling of great happiness, so joy is the mother of happiness. It's true, ma. When one walks in joy, one will be healthier and will be saved from the issue of high blood pressure. Also, when one walks in joy, people will like to approach him or her. Powerful, simple and so true.. wonderfully shared Edith.you made it so clear and easy. Thank you so much, my dear Rita, for the visit and for your kind words. Have a fabulous weekend in Jesus' name. Indeed Joy is a choice we make.A lot of situations may come our way but it remains our choice to overcome them with Joy.The benefits of joy cannot be over emphasized. Joy is really important in peoples lives. It strengthens people and adds more flavor to their lives. No one one has ever walked in joy and regretted it or complained. Joy is what everyone depends on to be happy. This is inspiring. Indeed a life of joy is a life worth living. Yeah ma, your joyful spirit is a welcome to many of us students. We feel we can approach you when we need to because you have a happy soul. I'll try to emulate your spirit because i can see it yields positive results. WOW! what a wonderful write up, i will learn how to walk in joy so that i will be healthier and more approachable. thank you ma for your lessons. Walking without joy can be detrimental to ones health and mental faculties, when you derive joy from what you do; no one has to force you to do anything, it all comes freely. walking in joy is what man needs in this world in other to live in peace with his fellow humans. No one would have imagined seeing you frown ma. You are a true manifestation of God's word in Isaiah 12:8"with joy I shall draw water from the well of salvation". With joy, we are enabled to certain benefits. Ma, this your post is really inspiring. There are so many things we get when we walk in joy. 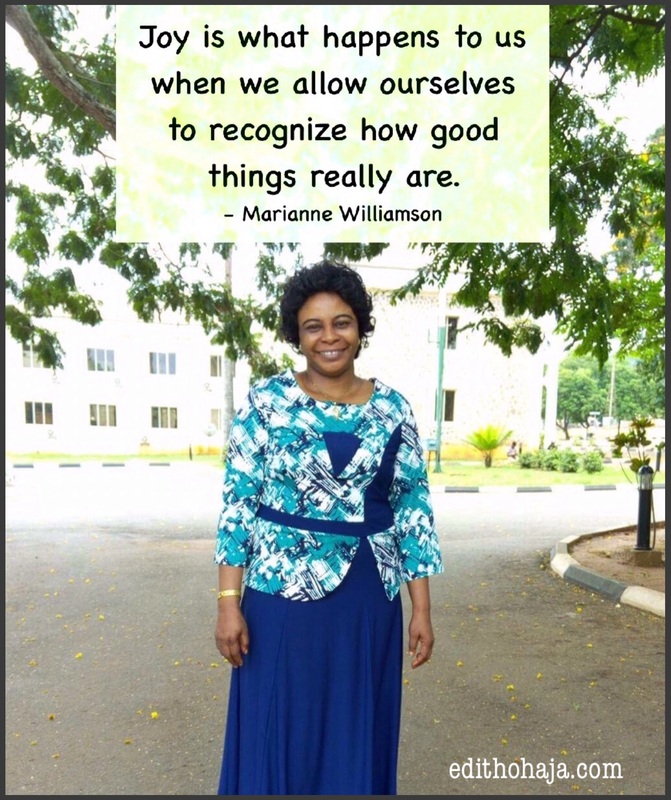 There is always an open door and people would see the goodness of God in your life, just as you are glowing in joy, ma. Joy is therapeutic and has a way of helping us to maintain stability in life. I must confess that i envy your glowing countenance.. So inspiring .. There is joy in my heart Flowing like a river I will praise Your name With thanksgiving and Love ...you reminded me of this song. Very nice post. This has been my personal philosophy and indeed a lifestyle. Our joy in life should not be dictated by circumstances. Life will always turn out well for people who keep a positive attitude towards it. I have learnt over the years that life will not give you roses. You owe it to yourself to stay happy no matter what happens. Trust in God and keep a positive attitude towards life. Nice one! This was beautiful and useful enough to carry throughout life! Walking in joy! There have been times when I was so down and I didn't know what to do, but the mere thought of what it'd cost if I just tried a moment's happiness strengthened me. Truly, everyone should make the personal decision of being joyous no matter the circumstance. Definitely life will throw lemons at you, as a Christian, you make lemonades out of it. Depression and anxiety shouldn’t be a part of our lives. God has given us hope of fullness of joy when we dwell in his presence. This is a beautiful piece ma. I never had the slightest idea that living a joyful life is capable of making me healthier,more approachable,and makes me more creative. I'm glad I learnt this today. You are indeed a living example ma’am. You always wear a smile on your face each time I see you. And when I see your smile, I feel like smiling even though I’m not a smiling type. Personally don’t always smile. But that doesn’t mean that I’m never happy. I am always happy but smiling is not my hobby. But I think I’m going to have a rethink from today. I’ll start practising how to smile from today. And I hope to give my own testimony one day. lol! There is fullness of joy in the presence of God and being happy is a personal decision one has to make no matter the situation surrounding it..Smile is a significance of joy and happiness which can brighten a soul. Ma, your smile is an inspiration to many people.. I pray that we should always have a cause or reason to smile. The joy of the Lord is my strength, the word JOY is a simple word but it is very important and powerful to our lives. when you walk in joy, you will always be happy and step on positive things in life. Well-done ma, this a great piece which is inspiring. Joy is one of the greatest gift of God. In the presence of God there is always joy and gladness. Happiness is a significance of Joy. Joy can mend a broken heart. Joy is very crucial and important in the lives of Christians,if not for any other thing for the fact that it is one of the fruit of the Holy Spirit. Joy is a good thing and everyone deserves to be happy. Although it's a thing of choice. But I believe everyone will choose joy and happiness. When you are always happy, you will live long because you have less worries, less troubles always happy no matter what especially when you know that God is by ur side. Everyone one around you will be happy because you will try to put a smile on their faces. Always be happy because happiness doesn't last forever, it comes and goes so always try to be happy with that you can make the people around you happy as well. Joy is an important virtue in ones life though its all about people's choice,for one to be happy he or she should have that inner peace in them which the source of it is from our God,joy is important in our everyday life as it reduces our worries and helps us live longer. Joy is the principle to living long and healthy. And Christ is the best source of joy even when it seems difficult. The Joy of the Lord is an advantage to us Christians 'cause it's our strength ,that's why the devils No1 motive is to steal it. Our Joy/happiness is a weapon over negative circumstances. Being joyful is a way we can use to fight all negativities of life. Let's all be joyful and forget about the pains life throws at us. Thank you ma for this post. Joy is a choice, but to me it is an important virtue which I cannot do without, there are benefits of smiling, been cheerful or happy its makes you grow in Christ and also people around you will always want to learn from you because u are joyful that will attract them to you, people will learn from you physically, emotionally and otherwise. Joy is essential indeed, but how can one change a frown to a constant smile on their face? By reminding yourself of God's goodness. It takes some practice but after a while, you'll be used to it. Cheers! When one is in God, the joy comes naturally. The Holy Spirit will always comfort us and give us joy. So the best place to find joy is in God.